Gratitude is a wonderful thing. The Bible encourages it (1 Thessalonians 5:18), and psychology has detailed why. Gratitude increases happiness and life satisfaction, while tending to decrease depressive symptoms . And it’s not just good for the giver, but also the receiver. I always appreciate it when my patients thank me for helping them. Genuine gratitude makes you feel good inside. Dr Caroline Leaf, Communication Pathologist and self-titled Cognitive Neuroscientist, must be positively glowing right now. She has been getting a lot of positive feedback from her fan base of late, and she has decided to share it with the world via her social media feeds. I’m sincerely happy for those people who feel they have been helped by Dr Leaf’s work. I remember my darkest days, feeling far from God and unable to find my way out of the emotional black hole of depression. It’s always so good to hear that others are finding their way out too. 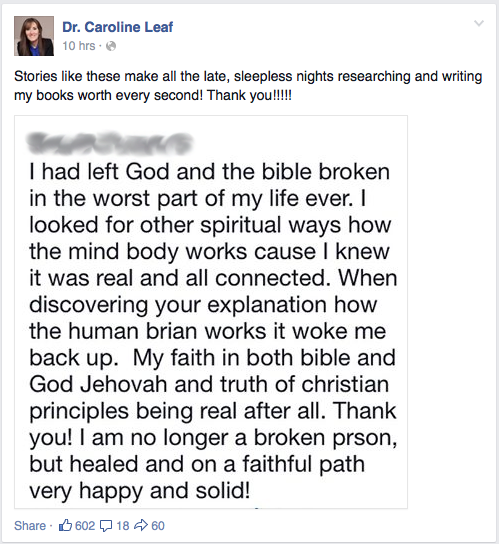 While I’m happy for those who are sharing their stories to Dr Leaf, I can’t say I feel the same for Dr Leaf herself. It’s excellent that people are sharing their stories with her privately but publishing them is another matter. At best, it’s ethically delicate. The testimonies are likely to be from people recovering from a psychological or emotional challenge, which carries an ongoing level of vulnerability. Even if Dr Leaf has their consent to publish their stories, sharing their problems with the world can still cause or contribute to psychological damage. Without knowing their whole story, Dr Leaf has no way of judging whom she may or may not harm. It’s also a bit disingenuous. By publishing a series of testimonials, Dr Leaf is essentially self-promoting. It’s one thing for a supporter to spontaneously offer her praise in a Facebook or blog comment. But Dr Leaf specifically asked for her followers to send in their testimonies so she could publish them. Testimonials are very good as a marketing tool. Who can argue with a person who says that Dr Leaf helped turn their life around? Saying anything negative just makes you sound like a cynical old boot. I’m sure would say that she’s asking for testimonies so that she can share the joy of others with her followers, or seek to give glory to God, or something like that. And perhaps she is. I’m not sure how she reconciles that with Jesus words, “Be careful not to practise your righteousness in front of others to be seen by them. If you do, you will have no reward from your Father in heaven.” (Matthew 6:1) But that’s for her own personal consideration. Whatever her intentions, the soliciting and publishing of personal testimonials from potentially vulnerable people is ethically delicate. I think she’d be better to step away from publishing these testimonials. And for her readers and followers, the testimonials need to be seen for what they are: just individual stories. Sure, we should rejoice with those who are rejoicing (Romans 12:15), and so good for those who feel Dr Leaf has helped them. But they do not constitute evidence for the therapeutic efficacy or scientific integrity of the work of Dr Leaf. This entry was posted in Biological, Caroline Leaf, Psychological, Spiritual and tagged advertising, anxiety, brand, branding, caroline, caroline leaf, cognitive neuroscientist, dr caroline leaf, Dr Leaf, endorsement, evidence, Facebook, gratitude, happiness, Leaf, levels of evidence, life satisfaction, marketing, placebo, positive attitude, self-help, testimonial, thought, toxic thought by cedwardpitt. Bookmark the permalink. I think is sad and disappointing when people quotes scripture then trash other Christians. There are so many other things to write about. Additionally, Dr. Leaf supports her findings with her own research and the research of a whole host of other doctors and scientist. There is nothing “self-help about her information. Get her book at the library and check out the bibliography. Personally I think it’s sad and disappointing when people support pseudoscience because the pseudoscientist says they’re a Christian. There are so many other things to support. Dr Leaf’s “research” is poor quality, and does not show any true benefit associated with her interventions. I discussed this in more detail in my post here https://cedwardpitt.com/2015/03/26/the-tedx-users-guide-to-dr-caroline-leaf/. The ‘whole host’ of other research that Dr Leaf uses has largely been misquoted or perverted in some way, or is actually irrelevant. I discuss this in more detail in my book “Hold That Thought” (in particular, chapter 10 discusses Dr Leaf’s penchant for misquoting and paraphrasing irrelevant references in some detail … http://www.debunkingdrleaf.com/chapter-10). As you can see, I have gotten her book and I have looked at the references. Actually, just in case you haven’t looked at the back of her books, Dr Leaf’s extensive looking bibliography is appears to be every book or article she every came across in her studies three decades ago. Most of it is outdated or in other ways irrelevant. Listing hundreds of tangential references is smoke and mirrors. It doesn’t actually mean anything. A true academic would only cite the specific references used in their book or paper, so the bibliography that you hold so dear is simply evidence that Dr Leaf is not a true academic.